Oh my ... where to begin with all the wonderful crafty goodness being launched by Tonic Studios on Hochanda to celebrate their 1st Anniversary. Choosing a favourite product is nigh on impossible and I have had immense fun playing with 'everything'. However it was great fun to have some messy play too and was pleased as punch to be asked to create some projects for the launch of the new Nuvo Shimmer Powders and Mica Mists. I want to also use the Craft Perfect 216gsm card to show that it could too be used in a mixed media project where we would be using lots of different products. The card does curl when drying but if you take your heat gun and quickly blast it on the back, it soon straightens out the card. For this project I have used the Jet Black card. I began by using the Cherry Bomb and Violet Brocade shimmer powders and covered the card, spritzing with water. As I was a little impatient, I did dry this layer with my heat gun. 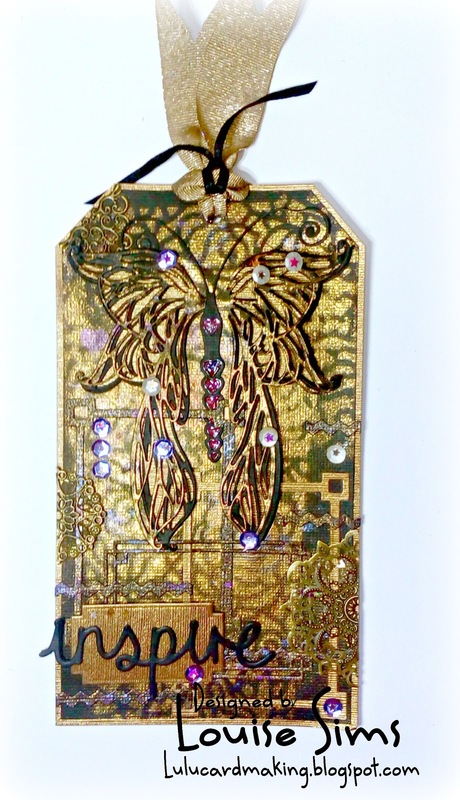 Using a piece of card from a cereal box, I die cut the Rose Petal design from the recently launched gift bag, spraying with Antique Gold Mica Mist, covering the whole of the tag. It created a wonderful pattern with depth. 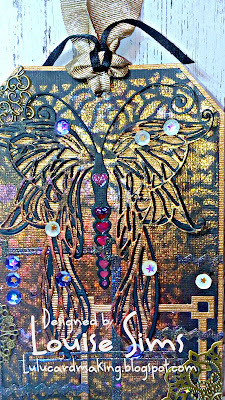 Once dry, using the Celestia Wings butterfly die, was cut from the top of the tag. On another piece of black card - measuring slightly smaller than the original tag - I die cut another Celestia Butterfly making sure it lined up with the the original cut. 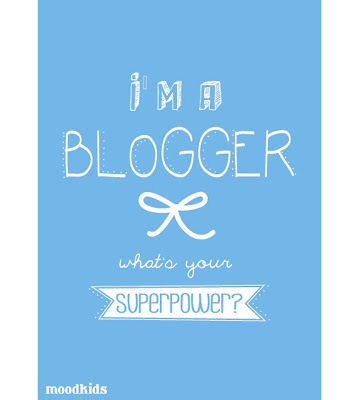 I then stuck this to the back of the main tag, leaving a shadow. 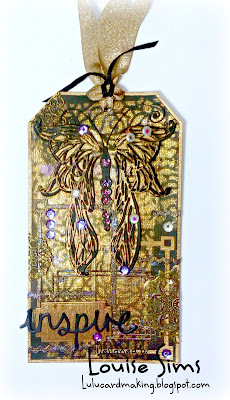 Finally, both were stuck to a larger tag from Cinnamon Silk craft perfect speciality card. 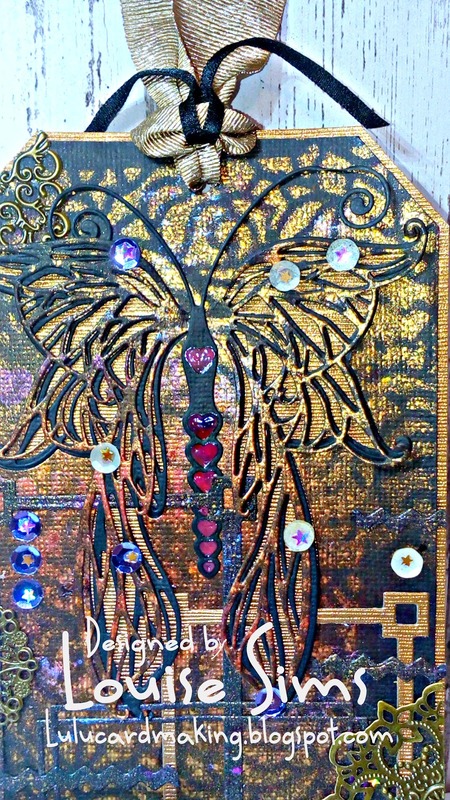 next I layered the 2 wings on top of each other, added a body and antennae, filling in the body with Moroccan red Nuvo Crystal Drops. 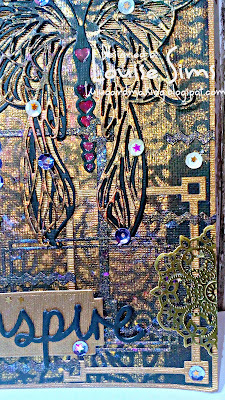 I created another background the same as the tag and from it I cut various frames using a mixture of the ATC dies. I even cut out the zig-zag bits from one of the panels for added texture. 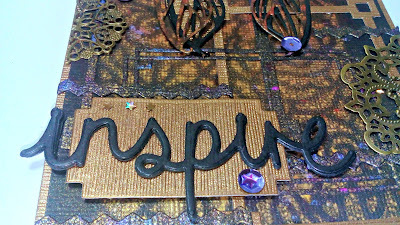 As a finishing touch, I die cut the Inspire 3 times layering on top of each other. This was stuck to a Cinnamon Silk panel. 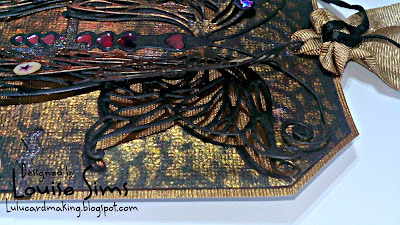 I added extra sequins to lift the colour and to match the original shimmer powder tones, added some metal embellishments and finally, ribbons at the top. 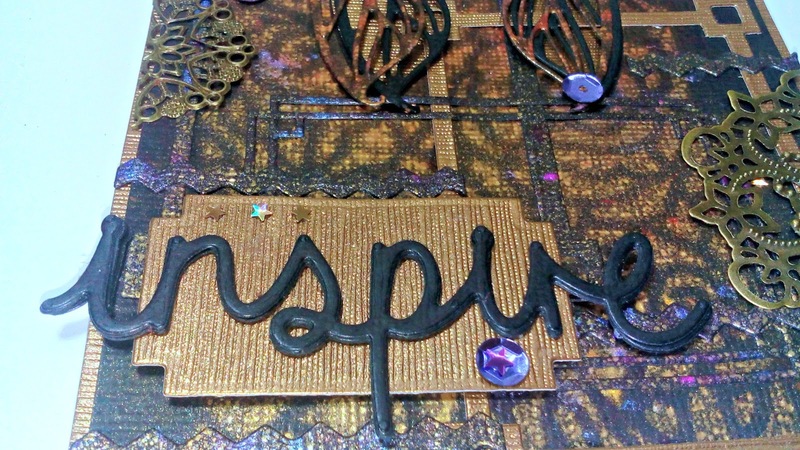 Must say am loving the 'vibe' from my tag and would be great to see it in a different colour way. Yep, another thing to add to my 'to do' list and fingers crossed, I'll get the time to complete the list. Hi Lou, this is gorgeous, love the colours and design. Beautiful butterfly. Fabulous mixed Media tag!! Thank you for joining our challenge at Dies R Us! WOW this is GORGEOUS Lou! Thanks so much for playing in our ‘Anything Goes DRU’ challenge at Dies R Us. Good Luck and please come back again soon! Stunning depth and detail on this most elegant project! WOW, just gorgeous. So glad you joined us at Die Cut Divas. Fabulous project, so rich and elegant - love it! This looks amazing love it so much Thank you for sharing with us over here today at the Classic Open Design Team Challenge and best of luck with your entry. Wonderful texture and dimension. 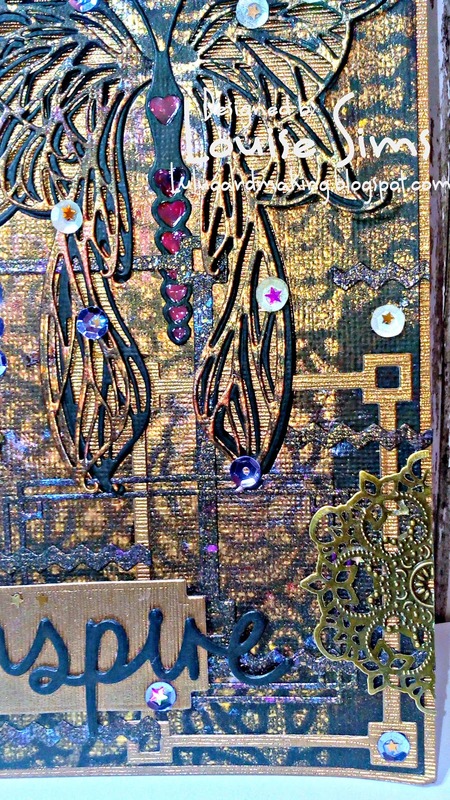 Thanks for joining us at Dies R Us Challenge Blog. We hope you will joining us for future challenges. Lou I enjoy looking at your lovely art. This is superb. Thank you for joining in at Rhedd's Creative Spirit Challenge this month. 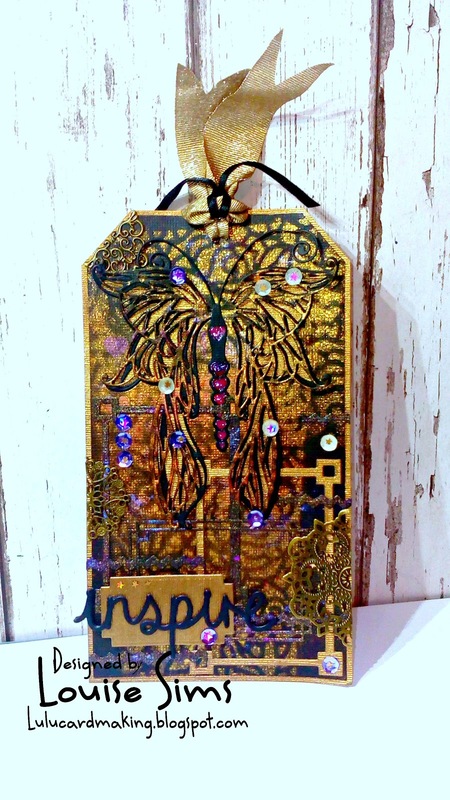 A fabulous tag, thank you for sharing it with us at Altered Eclectics.